Aswan (Arabic: أسوان‎ Aswān, Auncient Egyptian: Swenet, Coptic: ⲥⲟⲩⲁⲛ Swān, Auncient Greek: Συήνη Syene), umwhile spelled Assuan, is a ceety in the sooth o Egyp, the caipital o the Aswan Govrenorate. It staunds on the east bank o the Nile at the first cataract an is a busy mercat an tourist centre. The modren ceety haes expandit an includes the umwhile separate community on the island o Elephantine. Aswan is the auncient ceety o Swenet, which in antiquity wis the frontier toun o Auncient Egyp facin the sooth. Swenet is supposed tae hae derived its name frae an Egyptian goddess wi the same name. This goddess later wis identified as Eileithyia bi the Greeks an Lucina bi the Romans durin their occupation o Auncient Egyp acause o the similar association o their goddesses wi childbirth, an o which the import is "the opener". The auncient name o the ceety an aa is said tae be derived frae the Egyptian seembol for trade. Acause the Auncient Egyptians orientit toward the oreegin o the life-givin waters o the Nile in the sooth, Swenet wis the first toun in the kintra, an Egyp aaways wis conceived tae "open" or begin at Swenet. The ceety stuid upon a peninsula on the richt (east) bank o the Nile, immediately belaw (an north o) the first cataract o the flowin waters, which extend tae it frae Philae. Navigation tae the delta wis possible frae this location athoot encoonterin a barrier. The stane quarries o auncient Egyp locatit here wur celebratit for their stane, an especially for the granitic rock cried Syenite. They furnisht the colossal statues, obelisks, an monolithal shrines that are foond throughoot Egyp, includin the pyramids; an the traces o the quarrymen who wrought in these 3,000 years ago are still visible in the native rock. They lie on either bank o the Nile, an a road, fower miles (6 km) in length, wis cut beside them frae Syene tae Philae. Swenet wis equally important as a military station as that o a place o traffic. Unner ivery dynasty it wis a garrison toun; an here tolls an customs wur levied on aw boats passin soothwards an northwards. Aroond 330 AD, the legion stationed here received a bishop frae Alexandria; this later became the Coptic Diocese o Syene. The ceety is mentioned bi numerous auncient writers, includin Herodotus, Strabo, Stephanus o Byzantium, Ptolemy, Pliny the Elder, De architectura, an it appears on the Antonine Itinerary. It an aa is mentioned in the Beuk o Ezekiel an the Beuk o Isaiah. The latitude o the ceety that wad become Aswan, locatit at– 24° 5′ 23″– wis an object o great interest tae the auncient geographers. They believed that it wis seatit immediately unner the tropic, and that on the day o the simmer solstice, a vertical staff cast nae shadae. They notit that the sun's disc wis reflectit in a well at twal-oors. This statement is anerlie approximately correct; at the simmer solstice, the shadow wis anerlie 1/400t o the staff, an so coud scarcely be discerned, an the northren limb o the Sun's disc wad be nearly vertical. Eratosthenes uised measurements at Aswan (Elephantine) tae determine the circumference o Earth, uisin Syene as the oreeginatin point an Alexandria as the terminal point o a measured airc (based on shadae length at the solstice). The Nile is nearly 3,000 yards wide abuin Aswan. Frae this frontier toun tae the northren extremity o Egyp, the river flows for mair than 750 miles (1,210 km) athoot bar or cataract. 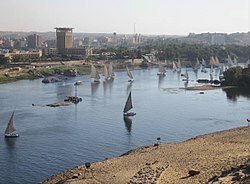 The voyage frae Aswan tae Alexandria uisually teuk 21 tae 28 days in favourable weather. Aswan is Egyp's hottest inhabitit ceety. Aswan's climate ranges frae mild in the winter tae vera hot in the simmer wi absolutely nae rain aw year. Meybe 1 or 2 mm o rain ivery 5 years. Aswan is ane o the driest inhabitit places on Earth. In winter the temperatures average frae 11 degrees at night to 25 degrees during the day. In summer the temperature averages 25 degrees at night to 40 degrees during the day. Aswan is ane o the driest inhabitit places in the warld; as o early 2001, the last rain there wis seiven years earlier. The last rainfaw wis a thunderstorm on 13 Mey 2006. In Nubian settlements, they generally dae no bother tae ruif aw o the rooms in their hooses. In 1999, South Valley University wis inauguratit an it haes three branches; Aswan, Qena an Hurghada. It wis the first university in Upper Egyp an it wis organized in depairtmental basis. The university grew steadily an nou it is firmly established as a major institution o heicher education in Upper Egyp. Aswan branch o Assiut University began in 1973 wi the Faculty o Education an in 1975 the Faculty o Science wis opened. Aswan branch haes five faculties namely; Science, Education, Ingineerin, Airts, Social Wirks an Institute o Energy. The Faculty o Science in Aswan haes sax depairtments. Each depairtment haes ane educational programme: Chemistry, Geology, Pheesics an Zoology. Except Botany Depairtment, which haes three educational programmes: Botany, Environmental Sciences an Microbiology; an Mathematics Depairtment, which haes twa educational programmes: Mathematics an Computer Science. The Faculty o Science awards the follaein degrees: Bachelor o Science in nine educational programmes, Heicher Diploma, Maister o Science an Philosophy Doctor o Science. Ower 100 academic staff members are employed in the faculty. Aswan is served bi the Aswan International Airport. Train an bus service is an aa available.Taxi an rickshaw are uised for transport here. ↑ Suʻād Māhir (1966). Muhafazat Al Gumhuriya Al Arabiya Al Mutaheda wa Asaraha al baqiah fi al asr al islami. Majlis al-Aʻlá lil-Shuʼūn al-Islāmīyah. ↑ Dijkstra, J. Harm F. Religious Encounters on the Southern Egyptian Frontier in Late Antiquity (AD 298-642). Wikimedia Commons haes media relatit tae Aswan.